Rowdy Roddy Piper was many things to many people. To some he was the boisterous, kilt wearing wrestler who squared off against the likes of Hulk Hogan, 'Superfly' Jimmy Snuka and also yelled at people as the host of Piper's Pit. To others he was an actor in some of the more interesting films to ever be lensed. With Roddy Piper it didn't matter. He was many things to many people but no matter what, whether he wanted you to hate or love him, you loved him. Roddy Piper sadly died this past Sunday of a heart attack. The man left us way too soon. At 61, he accomplished more with his career than most performers ever get a chance to fathom. He was a consummate entertainer who did what he did for the fans. He was once quoted as saying, "They cheered for me because they wanted to, not because they were programmed to." It would be very easy to look at the career of this icon as simply that: the fun career of a wrestling legend. However, Rowdy Roddy Piper was so much more than a wrestler. Sure, his movies may not be talked about in the same breath as something by Robert De Niro and Daniel Day-Lewis, but I am willing to bet that Roddy Piper's movies are ultimately a lot more fun. With titles such as They Live, Hell Comes to Frogtown and Terminal Rush littering his long resume, it is apparent that Roddy Piper never lacked confidence. Acting is a brutal profession. To get one role is a major achievement. Roddy Piper got several and he always brought his own acting style to it. He left a mark on every character he played. Many of his films went the straight-to-video route, but that shouldn't detract from Roddy Piper's work in them. It isn't every day that someone gets to fight Mr. T and Don "The Dragon" Wilson in their career. There's part of me that really wants to have a serious tone to this online eulogy. I was a big wrestling fan when I was younger. Sure, I, like most people, rooted for Hulk Hogan (a famous ring nemesis of Roddy Pipers), but I was always excited when Rowdy Roddy Piper came on the screen. I didn't know what was going to happen and I didn't care. I just knew I was in the viewing presence of someone awesome. And the fact that he knew he was awesome, for some reason made him even better. So it is with humble respect that I present 7 Rowdy Roddy Piper Movies You Need to See. With John Carpenter at the helm, Roddy Piper does probably his best work here as the character of Nada. At its core, this film recalls Roger Corman's X: The Man with the X-Ray Eyes. Essentially, Roddy Piper's character finds a pair of sunglasses that allow him to see that aliens are not only inhabiting the earth but that they've taken it over as well. 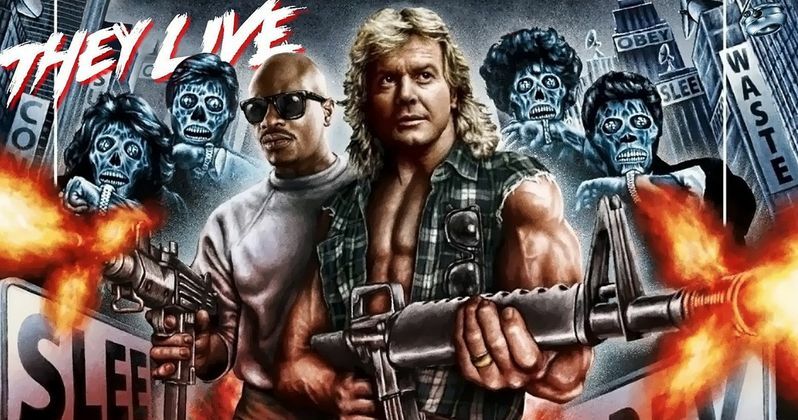 Looked at this way, They Live is a highly credible film that deserves a bit more than the cult status bestowed on it. When you go a little deeper, you see how it skewered Reagonomics and the idea of money trickling down from the top to the bottom. Ultimately, this film has both a hopeful and bleak outlook, but then what can you expect when such forces of nature as Roddy Piper and John Carpenter come together? If there's anybody that never took Roddy Piper seriously as a thespian, this film certainly helps push that argument down the pegs a little bit. How's that for a great title, right? Even better? The concept of this film more than lives up to the name. Roddy Piper is truly bold here as the main character Sam Hell. He is a prisoner of a bunch of women who are in charge of the US after a nuclear war. If this wasn't bad enough, there are beings who are trying to wipe them off the face of the earth now! Okay, aside from this sounding a lot like Wayward Pines, this movie shows Rowdy Roddy Piper in another role that he made all his own. It isn't just anybody that can handle the duties of saving the planet and making sure that he's keeping his ladies happy. Yes, Hell Comes to Frogtown is filled with winks, asides and the kind of moments that mark the comical aspect of Roddy Piper's career. We think when you step back and examine the film objectively, his performance truly stands out and shows his range. Alright, if aliens and bad guys that look like frogs are not your thing, Immortal Combat could be just the Roddy Piper film you need. This movie pairs him with Sonny Chiba as they tackle a band of ninjas. Okay, forget for a second that Roddy Piper doesn't seem like the type that could defeat the Three Little Ninjas, but the ninjas in this film are immortal. This is where Roddy Piper truly has a sense of who he is. And it's also why the producers of this film probably saw fit to match him with Sonny Chiba. The concept of this film might seem far out, but if there's anybody that's not gonna stress over fighting immortal ninjas it's Rowdy Roddy Piper. Again, no Oscars were given out here but one can't quantify what movies like this give the people watching them.